Creation Entertainment's Las Vegas Official STAR TREK Convention is the biggest party in the galaxy and the 45th Anniversary of Star Trek (and the 10th Anniversary of the Vegas Convention and Creation's 40th Anniversary too) only happens ONCE so we're going all out to celebrate! We are VERY happy to announce the spectacular location for the famous Thursday Night (Gold) and Friday Night (Captain's Chair) Parties for the 2011 Convention! It is one of the coolest locations in Vegas and the best part is that it is in our host hotel, The Rio! We've broken the bank and bought out the incredible Voodoo Lounge at The Rio for our two gala parties and we can't wait to welcome our Star Trek family to the unprecedented celebration. 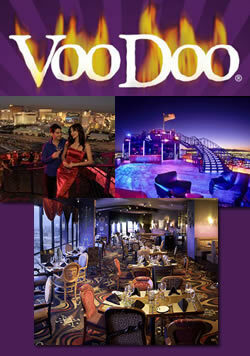 Located on the 50th and 51st floors of the hotel, The Voodoo Lounge is an upscale two level restaurant/lounge venue connected by grand staircase and elevators. Each level, high atop the Rio, comes with outdoor patios and seating for incredible views of Las Vegas, the Strip and the surrounding mountains. A performance stage for our entertainment attractions is located on one of the two levels. Some of our celebrity guests will perform in this unique setting and some will come by to mix and mingle. The parties will include a complimentary sumptuous dinner buffet with two delicious appetizers, three gourmet entrees, two specialty desserts, and free non alcoholic beverages. Cash bars will also be available for adults for alcoholic libations. THE FRIDAY NIGHT "CAPTAIN'S CHAIR CELEBRATION PARTY" is FREE for our great Captain's Chair Patrons. On this night we "own" the Voodoo Lounge on an exclusive basis during our party hours of 7 pm to 11 pm, after 11pm we can hang on a non-exclusive basis on the Voodoo Lounge and Lounge patio level. All under 21 patrons must leave the club by 10:45 pm on this night. WE ARE HAPPY TO ANNOUNCE THAT TIM RUSS & HIS BAND WILL BE PERFORMING AT THIS PARTY AS WELL AS THE HILARIOUS "HIDE AND Q" SHOW STARRING DENISE CROSBY and COMIC DEAN HAGLUND! We have kept aside a limited number of tickets to both of these parties for non-Gold and/or Captain's Chair Patrons. Grab your tickets early and be part of the history-making fun and raise a glass in celebration of the 45th Anniversary of STAR TREK with fellow fans from around the world as you look out over the city of Vegas! THE THURSDAY NIGHT "GOLD CELEBRATION PARTY"
THE FRIDAY NIGHT "CAPTAIN'S CHAIR CELEBRATION PARTY"
Join Q on his exciting new adventure to the alpha quadrant where he forces the Enterprise and her crew to abandon their rescue mission and partake in a deadly game. The major player Q decides to test is Tasha Yar, who is given Q's Power and offered full membership in his continuum. Will Tasha save Wesley and Worf from the hostile fanged animal soldiers? Will Geordi get his vision back? Will Data finally be human? What's a girl to do with all that power? All these questions and more will be answered in this hilarious new improv adventure Hide and Q" starring Dean Haglund as "Q" and Denise Crosby as "Tasha Yar". This special show will be performed LIVE at our two VOODOO LOUNGE PARTIES, set for Thursday and Friday Nights (both are now completely sold out, THANKS!) And meet Dean in the vendors room all weekend!